Posted: Wed Nov 21, 2007 12:58 am Post subject: One neat looking fly! 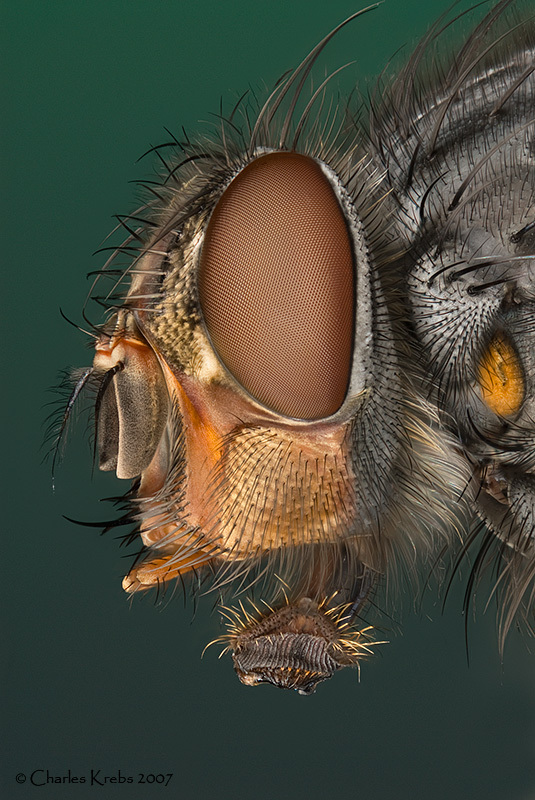 I never really though too much about how fantastic looking some of these "common" flies can be until I started doing some of these stacked images where you really get a sense of the details and textures that are present. Both images were with a Nikon D200 and a 50/2.8 EL Nikkor reversed on bellows. Beautiful! It proves that nothing is realy 'common' and even those nasty blowflies have something aesthetic, although it is more the 'motorcycle' type of aesthetics. Funny to see the composition is about the same. I think there are certain angles that work best. Also not so easy to take (dynamic) pics of (imo) without blowing out the light / white areas around the eyes. Subject is also one of my favourites (bubbleblower post last yr) - seems a good shape / size to fit all into a l/scape pic too in side view. pp... good observation on the exposure difficulties. Even with careful lighting it takes some extra effort to avoid "blowing out" the highlights around the eyes of many of these flies. Sometimes it's necessary to give less exposure overall than would otherwise be preferred, and then bring up the shadows in photo-editing software. With really difficult subjects it's sometimes necessary to resort (if possible) to shooting the same thing at two different exposures and "retrieving" the highlights from the otherwise underexposed image. I believe the orange lozenge-shaped area is the "anterior spiracle" -- one of several openings into the breathing apparatus. 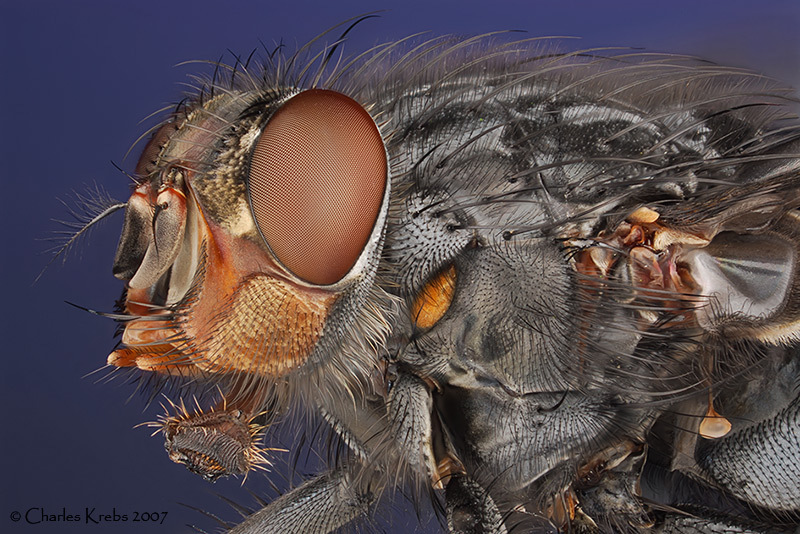 Visit the Anatomical Atlas of Flies at http://www.ento.csiro.au/biology/fly/fly.html. Click the button labeled "Click here for Atlas". In the popup window, click the tab labeled "Calyptrate" to show the anatomy of Musca domestica, then click on the desired feature for ID. 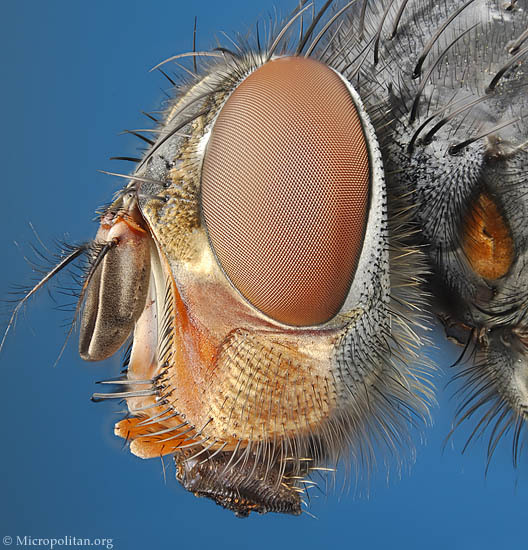 BTW, another great reference for info about flies is http://www.diptera.info . D50,100 IR, 90, 700, 800E and a box of old manual lenses. Can you show us how you light these subjects Charles, or if you have explained it before post the link to it? the first one has lots of detail but the second is just was this thing dead? if so how did you get it so clean? 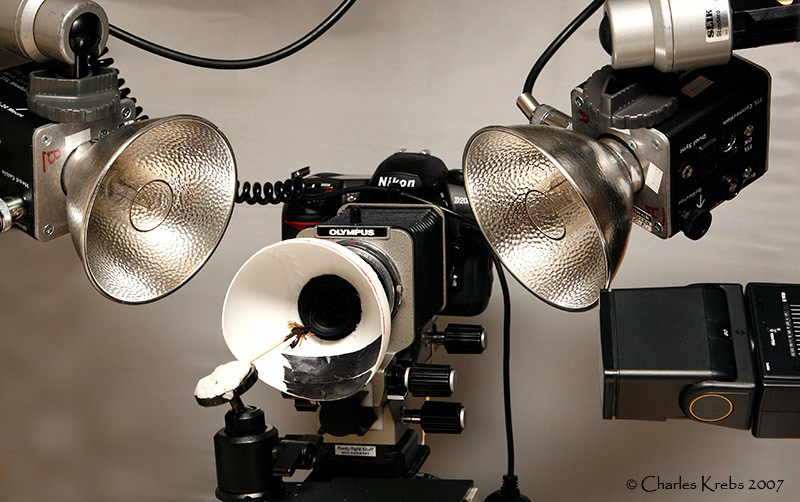 A diffusion dome (made from a plastic kids toy ball) is attached to the front of the reversed EL Nikkor. The dome is illuminated from the camera side by the two reflectored lights (No "direct" light from these two hit the subject, only that which passes through the dome). The dome is cut to a size where the open end stops just short of the plane of the subject. This allows me to angle in slight bit of direct "hard" light (from the slaved flash seen at bottom right. Normally it is much farther out but I moved it in close to include it in this setup shot.). 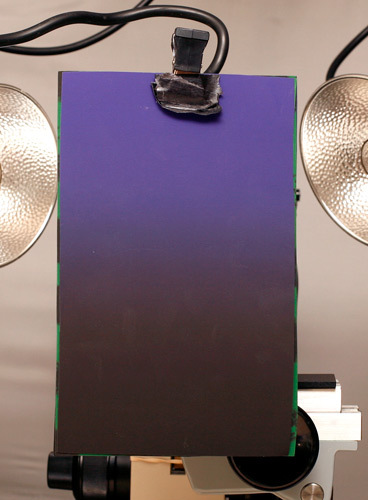 This helps in situations where the diffuse dome light is too flat. A little bit was used in each of these shots. 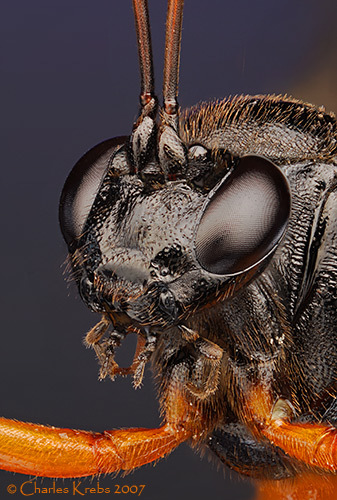 The background for these flies were printed up on a matte paper and simply clipped behind the subject. In the summer and fall months I often gather natural materials like leaves or grasses to use as backgrounds. But they are used so out-of-focus that you really can't tell what the background is. So I maneuver these components around, change power settings, and take test shots until I like what I see. Then I shoot the "stack" and head for the computer. Clear and sharp foto of the fly - and you´r right, these fly have a fantastic and interesting look. Great to be "backstage" - very interisting, thanks! Great description & illustration of the setup, Charlie. The subject shown in the setup appears to be something like an ichneumon wasp. Is this a new one or have we seen its portrait before? And finally, what's with the black tape on the bottom of the ball? You sure don't miss much! I'm amazed you spotted the ichneumon I was working on. The tape was there to eliminate a "too strong" white reflection I was getting on the underside. Amazingly detailed and well lit shots Charles.